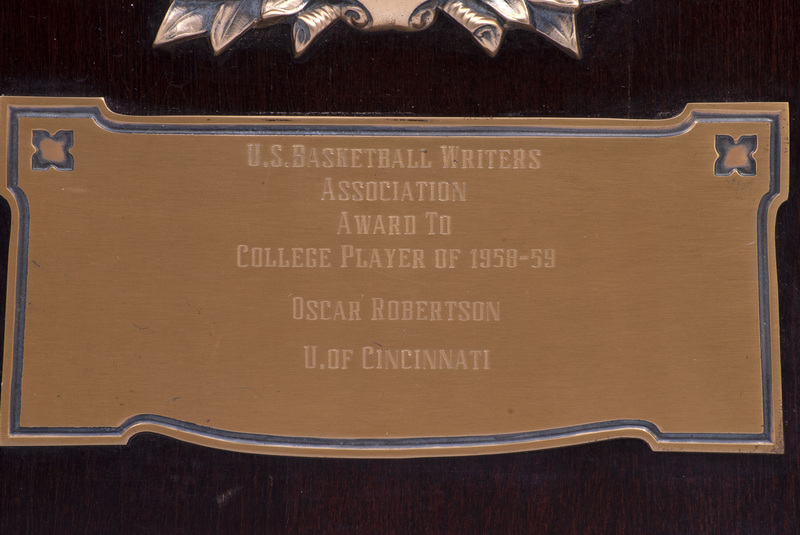 The inaugural 1958-59 College Player of the Year award presented by the U.S. Basketball Writer's Association was awarded to the great Oscar Robertson. He would win the following season as well. Fittingly, this award is now called the Oscar Robertson Trophy as he stands as one of the greatest college athletes of all time. 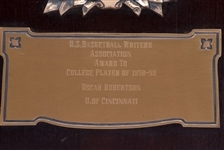 In each of his three varsity seasons with the University of Cincinnati, Robertson led the NCAA in scoring and was named Consensus First Team All-America as well as College Basketball Player of the Year. As a junior "The Big O" led the Bearcats to their first ever Final Four (beginning an unprecedented streak of five in a row) while averaging an incredible 32.6 points, 16.3 rebounds and 6.9 assists per game during the 1958-59 season. In recognition of this tremendous honor, Robertson was presented with this special plaque. 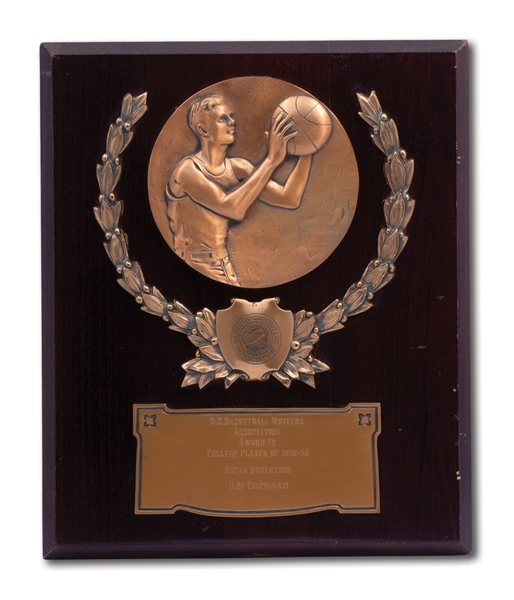 The well-crafted wood-based award has a raised bronze basketball player surrounded by a wreath and shield emblazoned with the Basketball Writers Association logo. A brass placard below reads, “U.S. 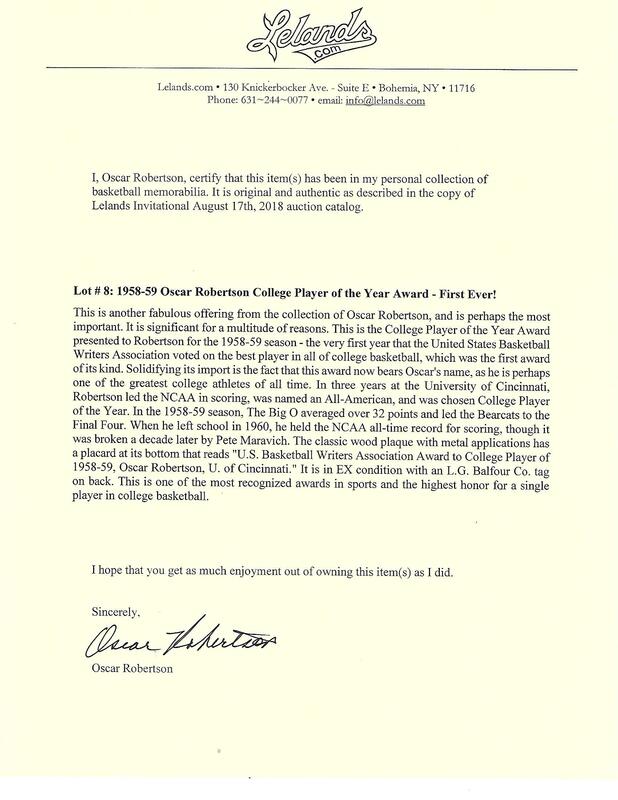 Basketball Writers Association Award To College Player of 1958-59 Oscar Robertson U. of Cincinnati.” Made by L.G. Balfour Co. as the Attleboro, MA company tag on the back indicates, the award measures 10" by 12" and an inch thick, weighing over four pounds. It remains in excellent condition with minor surface wear on the wood base and very little tarnishing on the large bronze/brass relief designs. A one-of-a-kind piece (the first one ever issued) that embodies The Big O’s incredible college career. Includes LOA from Oscar Robertson.